​FANUC has extended its range of Selective Compliance Assembly (SCARA) robots to include a model capable of processing parts weighing up to 6 kg. The SR-6iA is ideally suited for a variety of applications within a circular working envelope, including fast automated assembly, testing and inspection, packaging and material handling. It is FANUC’s largest SCARA robot to date, with a horizonal reach of 650 mm and a vertical stroke of 210 mm; while its high inertia capacity allows it to handle larger workpieces up to 6 kg. As with other models in the range, the SR-6iA benefits from an ultra-compact footprint (180 by 258 mm) to avoid interference with peripheral devices. Its lightweight design – coupled with integral air lines, 24 V DC power and I/O signal cables, as well as optional solenoid valves – enables easy system integration and continuous fast operation. For those new to automation, the robot is simple to program via the intuitive iRProgrammer, which can be accessed remotely via a PC or tablet. Further space can be saved thanks to the streamline R-30iB Compact Plus controller. The SR-6iA is available with a bottom cable exit or wall-mounting equipment, depending on the application. The SCARA range also offers the same intelligence and reliability available on all FANUC robots, including integrated iRVision, force sensing, conveyor tracking, fieldbus connectivity, integrated safety and most other software options. 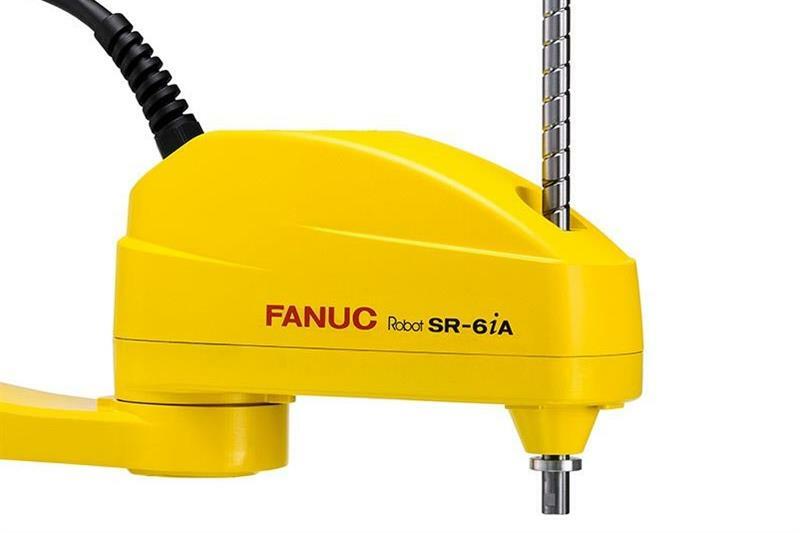 Andrew Armstrong, sales & marketing anager at FANUC UK, comments: “The introduction of the SR-6iA to the UK market will represent a step-change in SCARA technology. Previous models have boasted speed of operation and compact footprint, yet our newest offering combines these benefits with double the payload capacity, as well as extended reach. As such, the SR-6iA can open up new market opportunities for industrial end-users by improving the capacity they can offer their own customers.